In the last post I said I’d show you how we personalized all of our bedroom wall art. Here goes. When we were trying to figure out what to hang about the bed, we went back and forth between many options. A big painting? Wall sconces with candles? 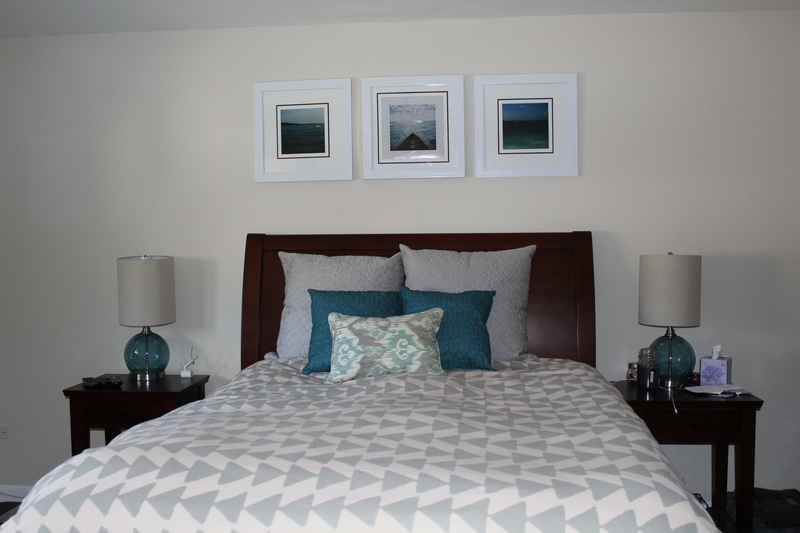 A gallery wall? While at a thrift store, we saw 4 identical square frames and thought hanging them 2×2 would look great. Unfortunately, we didn’t have enough room between the headboard and the ceiling for the 2×2 arrangement. Three in a row looked great though, so that’s what we settled on doing. So what’s the personalized part of it? Well, all 3 photos are of different waterfronts on trips we’ve gone on together. We have taken each of the photos ourselves. The photo on the left is of Lake Geneva, a place my family visits often. That photo was taken off of the main pier in the Riviera. The center photo was taken on our last family vacation while we were kayaking off of Cococay. Believe it or not, that picture was snapped with one of those disposable water-safe cameras. I know, I was surprised at the quality myself. The photo on the right was taken on our honeymoon while we were visiting the ruins in Tulum. This framed word art print is a fairly new addition. Dan made this himself by typing out words to Elvis’ “I Can’t Help Falling in Love with You,” which was our wedding song. Kind of a cheesy, played out first dance song, I know, but I’ve always loved it. Don’t judge. 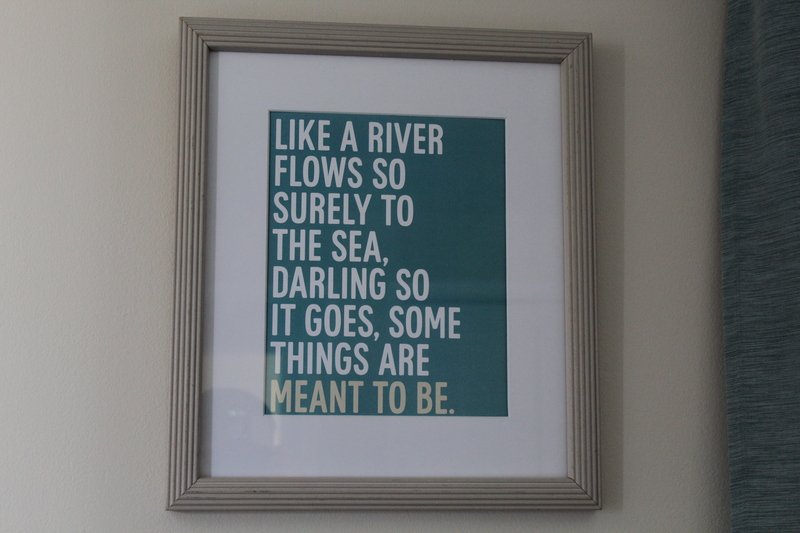 Once we realized the lyrics included a reference to the sea, we thought this would be a fantastic addition to the room, and now I think of this song, and our wedding dance, every time I see it. Finally, for the last of the DIY wall art, we have this set of 3 pieces. The idea for the middle piece of art came about when I noticed the glass for this frame was broken in our move. I thought I could use it for something 3D, like a shadowbox. 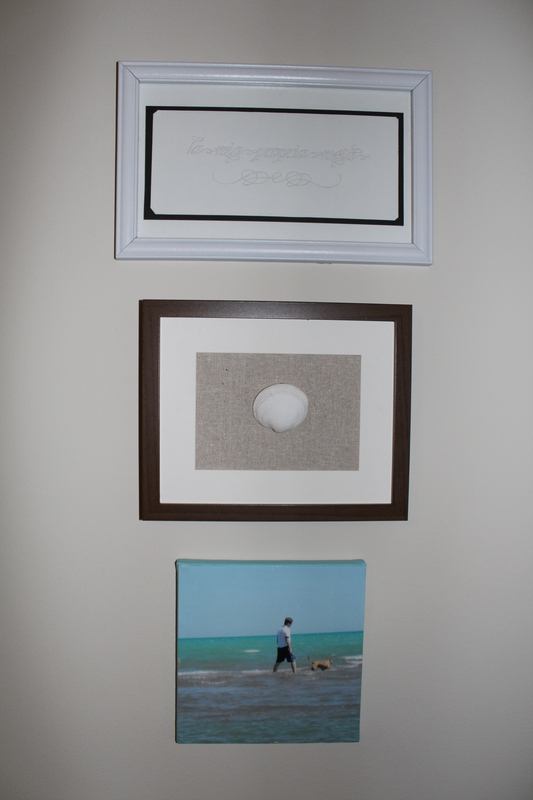 I backed the frame in some leftover linen I had and I hot glued the seashell directly onto the linen. The shell is from Cococay as well. We picked it up right off the beach. Finally, the last piece of art I made using this tutorial. She explains the whole process, so I won’t go into how I made it here. I used an 8×10 photo I had that I got as a freebie from Walgreens with a coupon code a while back. This is from one of those lovely Saturday mornings we’ve spent at the Montrose dog beach, just hanging out and basking in the early morning sun. I snapped this photo of Dan and Phoebe walking on a sandbar and to me, it just epitomizes everything I love about summer: warmth, water, slow starts to the day, and sand in between my toes. As mentioned before, the room feels serene and tranquil. Being surrounded my some of my favorite memories captured in the wall art is a great way to start and end each day.